Vada's Blog Stamp Inks and Paper : For the Love of “Winter”. 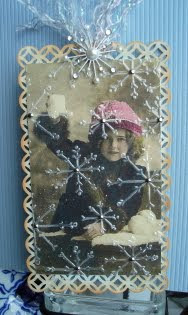 This week Louise at Kard Krazy has chosen “Winter”, for the theme. brads. My embossing foder is from Sizzix. Won’t you join us? I would love to see what you create for this theme. Enjoy. This is SO pretty! I absolutely LOVE the giant snowflakes!!! Vada, the snowflakes are add much beauty to this Winter tag! The image is so darling and of course your border punching is perfect! I can't seem to do that to save my life! Gorgeous tag! This truly looks magical! I love the snowflakes! Such a lovely tag, the embossed acetate looks fabulous. Vada, this is exquisite! I love the snowflake-embossed acetate over that beautiful vintage image, and the edger punch is such a wonderful touch. looks great with that embossed acetate over top...like the edging too. Wow, this is very pretty, love that embossed acetate. This tag is really nice. 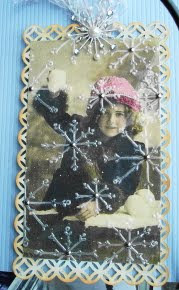 The snowflakes are a nice "quiet" embellishment that really makes the card elegant. Fantastic tag and great use of the acetate. Beautiful use of the edge punch and the overlay. Gorgeous tag! OHHHHH Vada, I love the acetate over the top, It really looks like real snowflakes,and the frame is exquisite! Stunning tag!! Stunning tag - and very beautiful. What a wonderful tag.. That image is wonderful..
A gorgeous tag, Vada. the snowflakes over your image is so effective.